Ralph Barr appears to have been born in 1881 in Hammersmith, West London into a working class family. He appears to have been in the Armed Forces during World War One. He came to the anarchist movement after work inside the trade union movement and then with the National Unemployed Workers Movement, where he acted as secretary to its Hammersmith branch. He served on many committees during the course of his involvement in the anarchist movement and was known for his hard work, reliability and willingness to attempt to transcend differences within the movement, Mat Kavanagh referring to him as “a level-headed man and a good worker”. He spoke at the long established pitch for anarchist speakers at Hammersmith Grove. He became the secretary of the London Freedom Group and was one of those who pushed for a new approach, which resulted in the old-timers George Cores, Leonard Harvey and John Humphrey leaving the Group. Together with Leah Feldman he was behind moves to encourage different anarchist papers to close down and harness their energy to one paper. Frank Leech and co. in Glasgow agreed to wind up their paper Advance and merge in with Freedom to create The fighting Call (“Published in Confederacy by Freedom Group, London and Anti-Parliamentary Communist Federation, Glasgow,” October 1936-February 1937, 4 issues.). Later on Fighting Call was dropped in its turn to support Vernon Richards’ paper Spain and the World. At the same time Barr wrote to Aldred and the United Socialist Movement (USM), saying:“Get unity with the APCF surely it is not impossible. I am in cooperation with them and there is no earthly reason why the USM should not be” (September 1936). However the differences in Scotland that Aldred seemed to savour, stopped this coming about. Emma Goldman came to Britain on behalf of the Spanish libertarian movement in 1936, with the aim of setting up a CNT-FAI Committee in London, with the aid of the Freedom Group. Barr became the secretary of this new committee, which had its office at Goldhawk Mew. He also was involved in setting up the Anarcho-Syndicalist Union (ASU) in early 1937 along with Werner Droescher (see his biography here at libcom) with the aim of creating an anarcho-syndicalist union in Britain. There already existed the Syndicalist Propaganda League, with Wilf MacCartney, Stenzleit, and A. Sugg as its chief animators. They considered the unveiling of the ASU as premature, although at its beginnings it attracted a fairly large number of young members, with MacCartney apparently, despite his reservations, joining it. It also received support from Leech and his comrades in Glasgow. 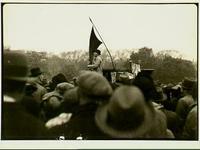 He spoke in Hyde Park, after a large demonstration, on May 1st, with John Hewetson, Tom Brown, Mat Kavanagh, and Emma Goldman in support of the Spanish anarchists to an enthusiastic crowd (see photograph). The writer Ethel Mannin writes about him in her fictionalised account of Emma Goldman’s life, where he, under the name of Charlie Banes, is described as doing all the donkey work at the Goldhawk Mews office, “making tea for Rose (Rose Steinman=Emma Goldman N.H.), typing, sticking on stamps, taking sacks full of circular letters and leaflets to the post, resenting, always, the curt tone in which she invariably addressed him”. He mutters to Mannin (Margaret Thane in the book) that he is treated “as though I was a bloomin’ office boy”. Mannin mentions that she first meets him selling red and black handkerchiefs brought back by Goldman from Spain at meetings to raise funds for the Committee. He is described as “a dejected, shabby little man with pale watery blue eyes, and a drooping mouth” and supported himself by betting at race meetings and the dogs. “He had graduated through the official labour movement to what he morosely referred to as ‘libertarian thought’ ”. Reginald Reynolds, the partner of Ethel Mannin, and who was, like her, involved with the Committee, is explicit in his biography My Life and Crimes that there were irregularities with its funds. He and Mannin wondered how Goldman supported herself without any visible means and he alleges that after she left Britain in winter 1939 it came to light that she had dipped into the money, involving hundreds of pounds given by well-wishers and supporters, many of whom were poor themselves. What was worse though was that some thousands of pounds had been raised by a couple of anarchists by means of a swindle of a British fascist. This money had been earmarked to buy arms to supply the Spanish anarchists. Barr had gone to the South of France to facilitate this, but had spent the money on a young woman there. Reynolds writes that he and two others tracked Barr down to London, where he was confronted. The others wanted to exact physical retribution on Barr but Reynolds, a more gentle soul, averted this. In his biography Reynold wrote that: “I think the man had really been sincere, in his time” and that: “He behaved, when we ran him to earth, like a whipped dog”. In her short story Downfall of a Comrade in the collection No More Mimosa, Mannin vents her anger on Barr. In this again fictionalised account Barr is now Joe Bane. The confrontation between Barr and the others ends the piece with Bane addressing the main protagonist (obviously Reynolds) with the words “Try not to think too badly of me, comrade”. Meltzer writing in his The Anarchists in London wrote that Barr seemed “rather unfairly treated” in Red Rose. He seems to have been unaware of the grave charges of embezzlement against Barr, who appears to have disappeared out of view after this and to have died in Hammersmith in 1951. Photograph from Vernon Richards collection at International Institute of Social History. Mannin mentions that she first meets him selling red and black handkerchiefs brought back by Goldman from Spain at meetings to raise funds for the Committee. In the early 1970s the Glasgow ORA was contacted by the relatives of an old Hamilton anarchist who had just died. I believe he’d been a miner and had expressed a wish to have his coffin covered with a red and black flag. For this purpose we lent them our Bakunin banner. It was returned with the two lengths of black cord that had attached it to the coffin. A comrade also received a gift of a carefully preserved red and black handkerchief which was beautifully printed with images of the CNT/FAI. I don’t know what happened to the hanky, though several times we met some young Hamilton lads whose families had made a super new anarchist banner (like a traditional union) that they proudly carried on demos. Do you remember the name of the Hamilton annarchist, Auldbod? Sorry I don’t think I was ever told his name. I do remember Bill W. telling me he had lent our ‘Bakunin’ banner to a family in Hamilton, as their grandpa had just died. Sometime after that two young Hamilton boys turned up for a demo. They had brought with them an impressive Hamilton anarchist banner. It was new though it had been produced in the traditional style of a union banner. The police insisted they remove the large brass ‘spear heads’ from the poles before they could march with it. It was touchingly naive that the boys had thought the Glasgow police would let them carry such potentially lethal implements.